Well the time has come and it can’t be avoided, it’s time for a new roof. It’s going to be unbelievably hectic for a few days, and unfortunately it is going to get messy and it’s going to get loud. Let Adelaide’s leading Roof Restoration company give you the ins and outs of what is going to happen. First up, before we even start we will deliver all the required roofing materials to your home the day before we start any works. We will bring a skip to throw away the waste materials from the old roof. You will be surprised how much rubbish there is when replacing a roof. We will also bring a portaloo so that our workers don’t have to come into your house to use the toilet and possibly make a mess that nobody should have to clean up. Did we mention the mess? It is usual for a complete restoration for debris to be deposited in the attic space or in the yard around your home. And with all the multiplicity of trades in your roof the noise from the brooms, wheelbarrows, shovels and power tools like circular saws and nails guns will be ongoing throughout the days. Is there anything you can do to help your Adelaide roof repair contractor make the installation of a new roof go without obstacles? Horizonline is more than happy to highlight what you can do as a homeowner to get ready for a roof replacement. Make sure that you protect any items, like clothing, furniture and bedding from dust falling from the ceiling with sheets during construction as you never know what might become loose. It is advisable that roof and wall fittings like mirrors, paintings, shelves or other objects hanging from the walls be removed to prevent them from falling during construction. Breakables such as china or glassware should also be stored away from precarious locations. Remove items like potted plants, patio furniture, BBQs and anything else that could get hit by falling debris out of the “drop zone”. We suggest that they are a good 5-10 metres away from your house while the roofers are working. Roofing contractors will need access to your drive to get rid of the rubbish and to load the materials, so it would help if your vehicles are parked in the street whilst the works are carried out. That way any falling materials will not damage them either! If your car is in the garage, you might not be able to get it out whilst the skip is on your drive. We just like to remind you that it will be a building site and children and pets don’t belong on any construction site. For their own safety, please make sure they cannot access any work areas. If you are able to remove TV antennas and any solar panels from your roof and give your lawn a mow too as it makes it more difficult to clean up afterwards. Make sure you cover over your pool too as you won’t have to fish out any debris later. Did We Mention The Noise? We can’t get away from it, installing a new roof is a noisy job. If this may disrupt your everyday lifestyle or you have small children or pets that may be scared then you may want to go explore the possibility of finding alternative accommodation whilst the roofing works are being carried out. There are a number of our clients that decide to take a week away whilst we carry out our roof replacement. Whatever issues you may be having with your roof you have Adelaide’s leading roofing repairs company. 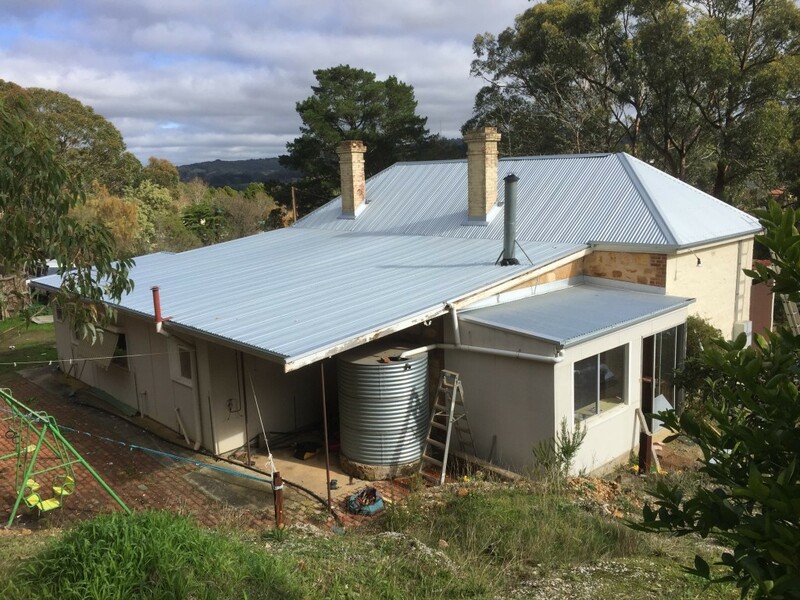 Whether your property is new or old, Horizonline Roofing has been servicing Adelaide and South Australia for over 20 years and offers full roof restorations, roof repairs or even a complete roof replacement – no job is too big or small. If you are in Adelaide or South Australia and need a quote for your roof restoration or roofing repair feel free to get in touch with our friendly team at (08) 8380 5796.